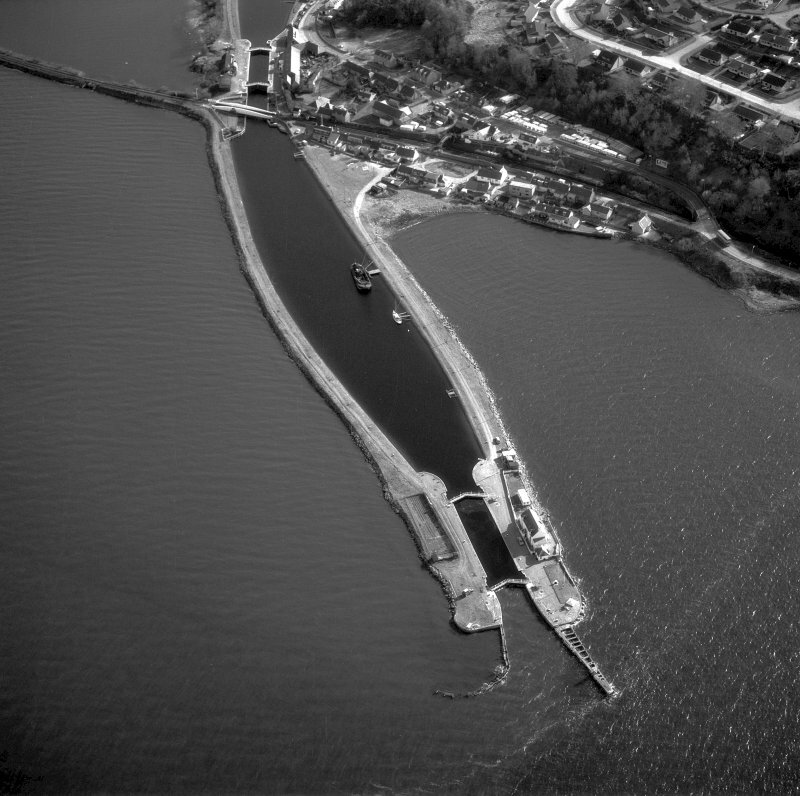 Oblique aerial view centred on the lock, house, piers and beacons, taken from the NNE. Oblique aerial view centred on the lock, house, piers and beacons, taken from the SE. 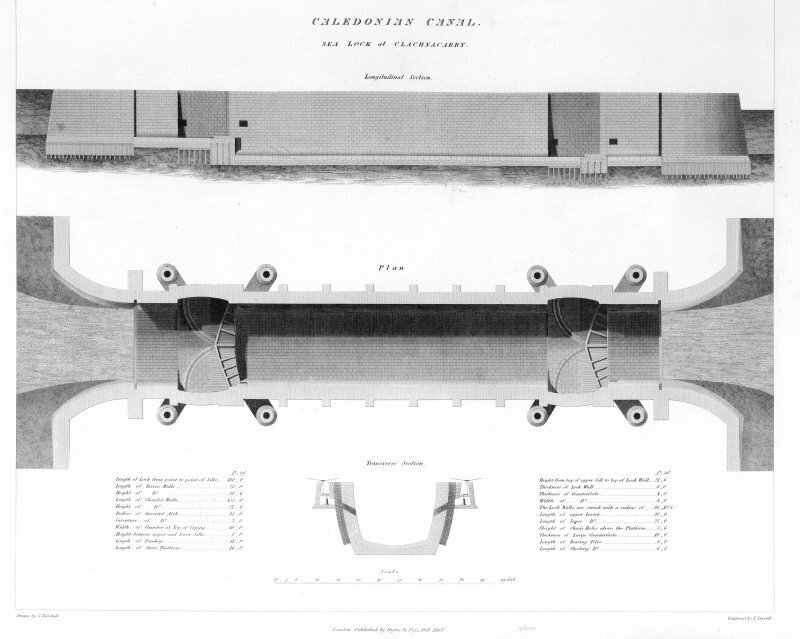 Longitudinal section and plan of sea lock at Clachnaharry, Caledonian Canal. 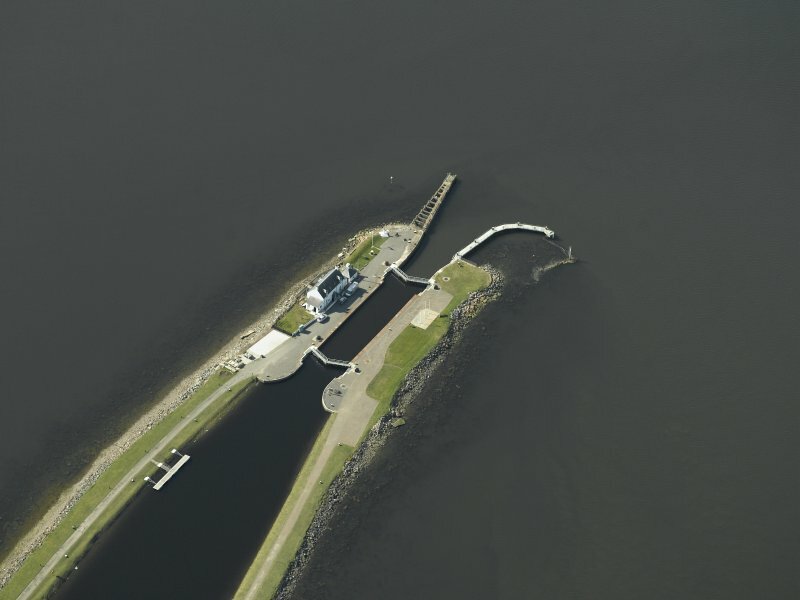 Aerial photograph showing Clachnaharry Sea Lock and Lock Keeper's House Digital image of A 36846. 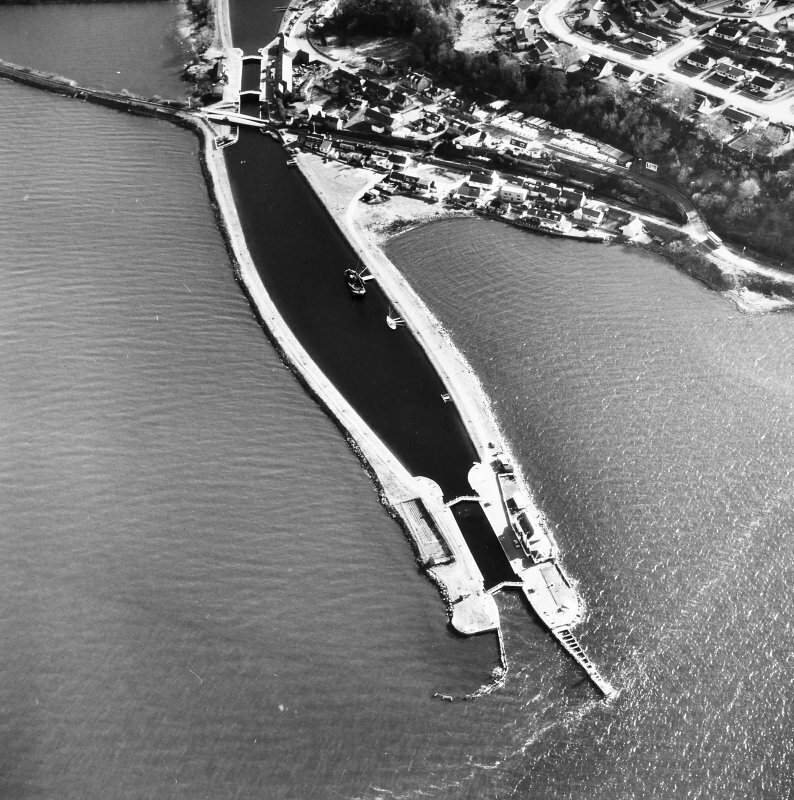 Oblique aerial view centred on the lock, house, piers and beacons, taken from the ENE. Inverness, Clachnaharry, Caledonian Canal, Clachnaharry Sea Lock View from the west-north-west taken from the end of the protective breakwater looking up towards the bottom lock gates of the sea lock, with the lock keepers' houses on the right Digital image of D 64152. Inverness, Clachnaharry, Caledonian Canal, Clachnaharry Sea Lock View from the west-north-west looking away from the Beauly Firth and up to the bottom lock gates of the Sea Lock. 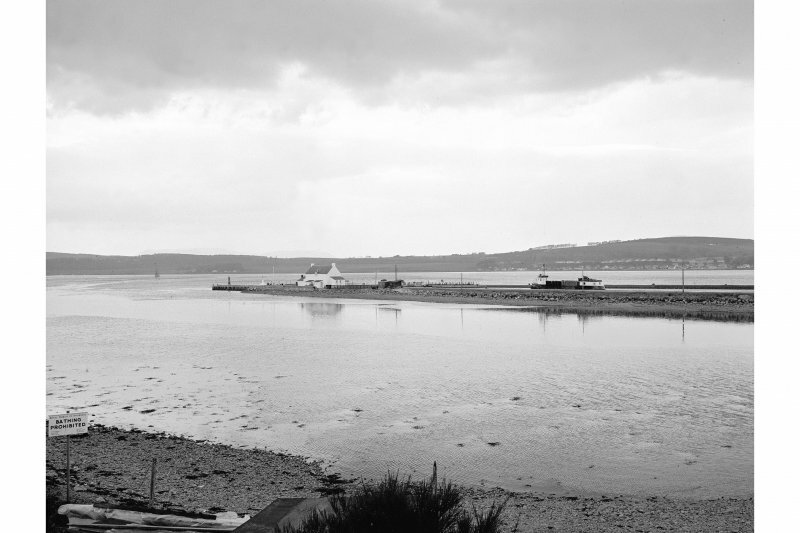 The Kessock suspension bridge is visible in the distance in the top left corner Digital image of D 64151. 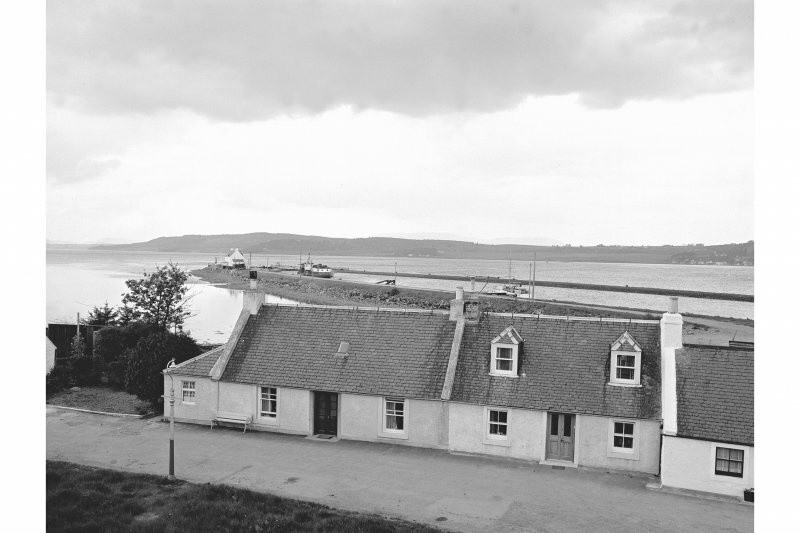 Clachnaharry Sea Lock and Lock Keeper's House. Aerial photograph. 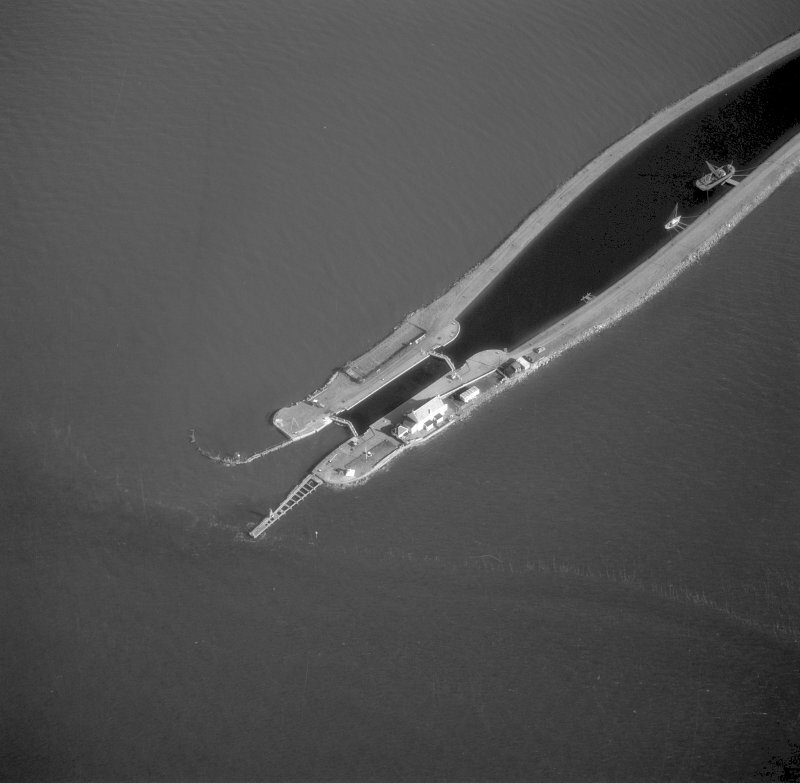 Aerial photographs showing Clachnaharry Sea Lock and Lock Keeper's House Digital image of A 36842. 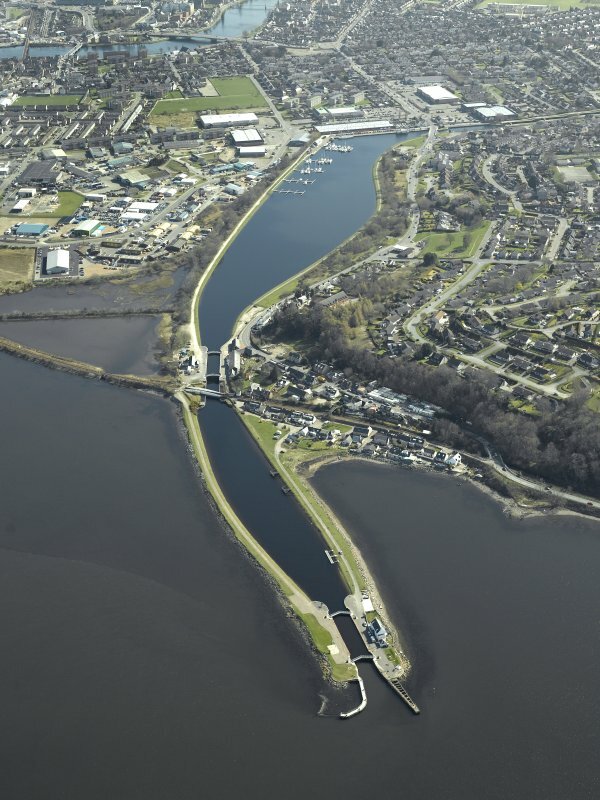 General oblique aerial view centred on the Caledonian Canal, locks, swing bridge and canal basins, taken from the NW. 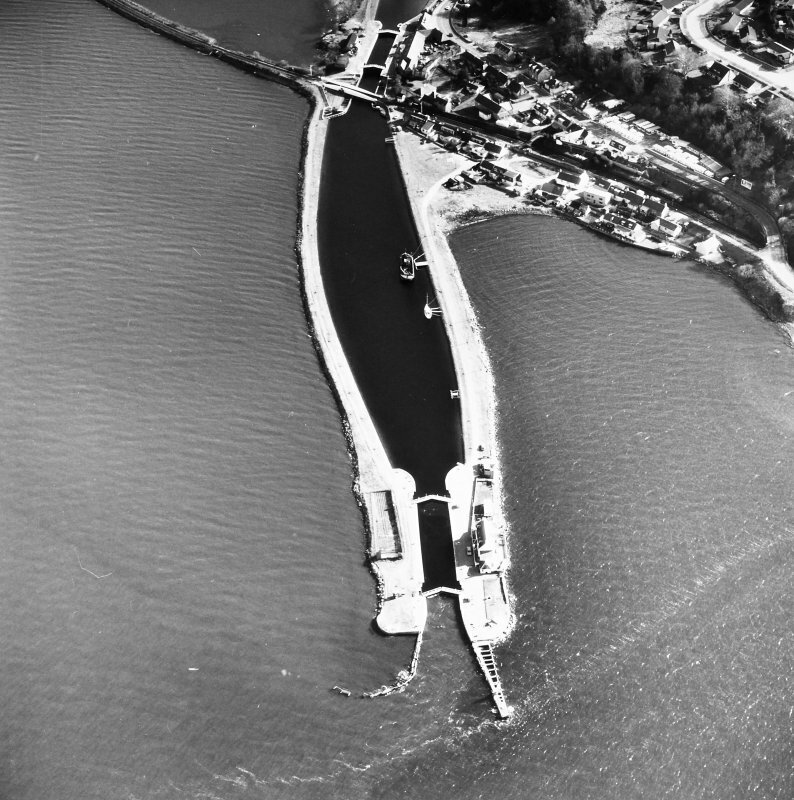 General oblique aerial view centred on the canal, locks, swing bridge and canal basins, taken from the WNW. 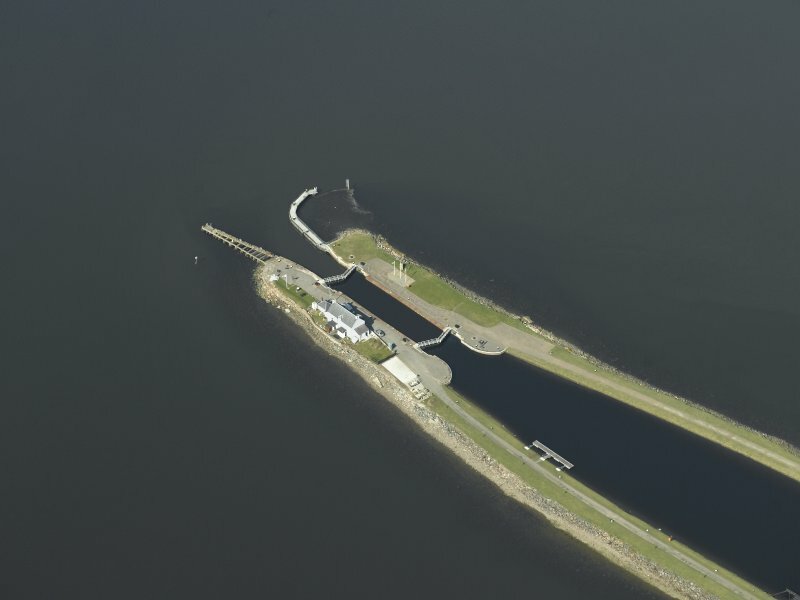 Clachnaharry Sea Lock View of entrance locks from West. 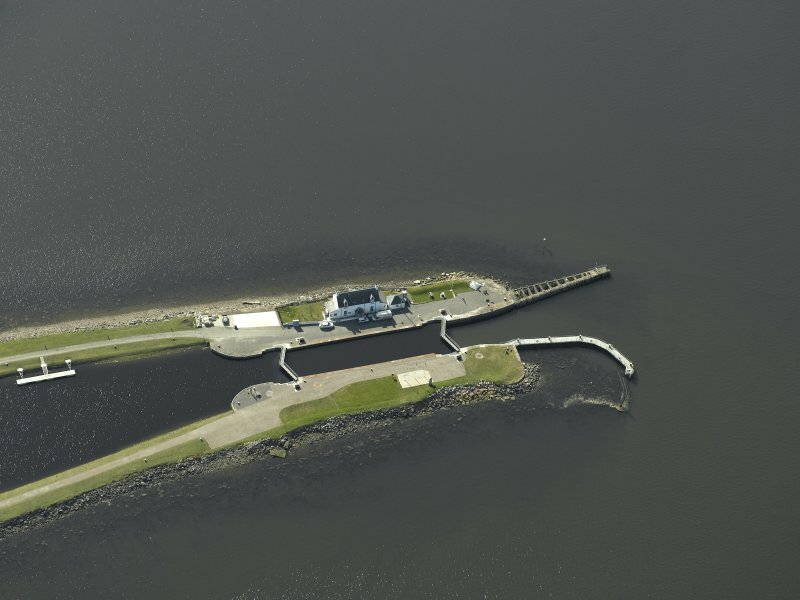 Oblique aerial view centred on the lock, house, piers and beacons at Clachnaharry, Caledonian Canal, Inverness, taken from the SSE. Engraving of elevation and plan inscr: ''Map of the Caledonian Canal or Inland Navigation between the Eastern and Western Sea capable of admitting a frigate of 32 guns.'' Includes longitudinal section. For associated canal basin (adjacent to SE), see NH64NW 30.03. For associated canal offices (NH 64943 46439) and Telford commemorative plaque, see NH64NW 86. 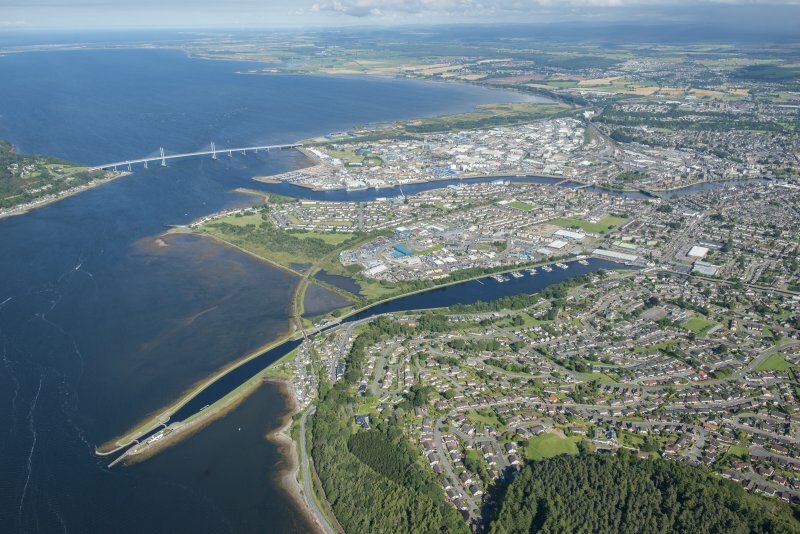 Not to be confused with Inverness Harbour (centred NH 664 462: at mouth of River Ness), for which see NH64NE 129.00. Location formerly entered as NH 6447 4674. During the construction of this lock in 1810-11 it was decided that oak from North Wales should be used for the gates. These gates were replaced between 1890 and 1906 by new ones constructed from oak and steel. By the mid-twenthieth century the lock had been mechanized. The creation of this lock and the adjacent basin (NH64NW 30.03) constituted a major achievement by the canal builders. 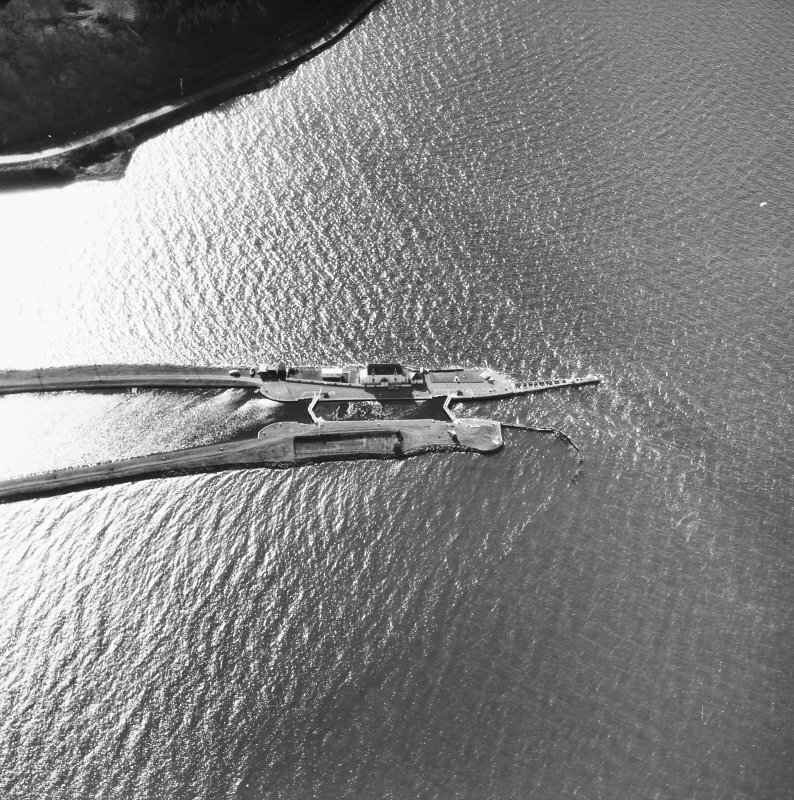 As there was a stretch of soft mud at the edge of the Beauly Firth, it was necessary to build up two enormous parallel embankments stretching out 400 yards into the firth in order to reach deep water. These embankments, resting on a base of quarry waste, were used for digging out this sea-lock. 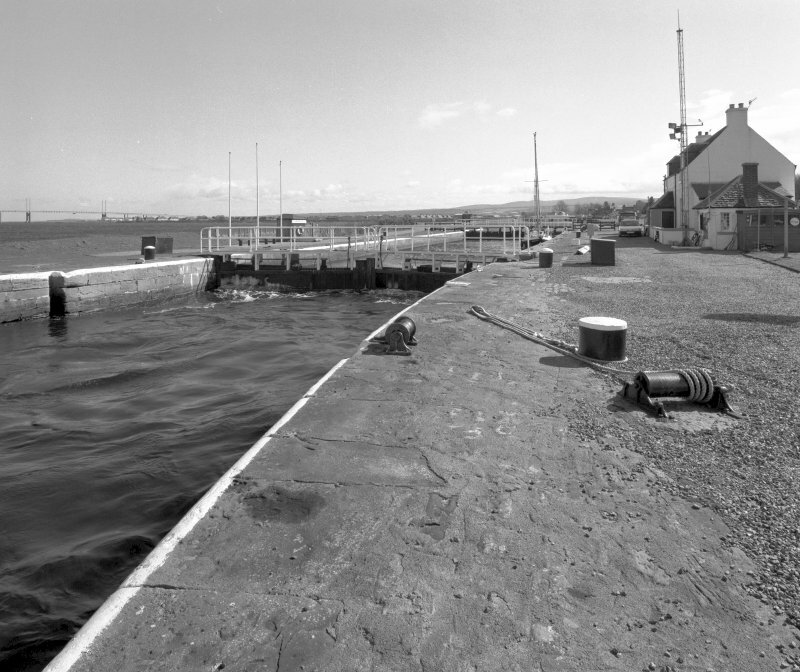 Hand pumps proved inadequate for keeping out the sea at one stage, but the use of six horses or the more expensive equivalent power in a steam pump, kept the problem at bay until the lock had been completed. It is essential to keep constant vigilance and undertake timely repairs, such as those carried out on the foreworks in the 1920s. 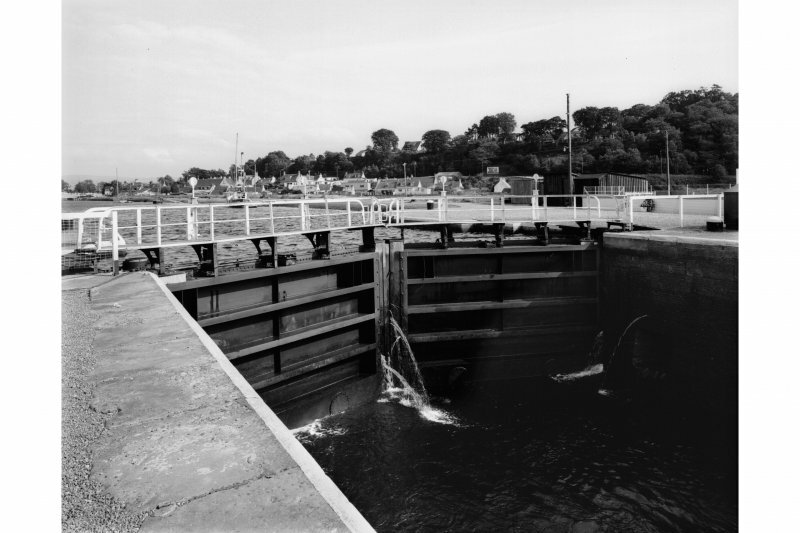 The two pairs of lock gates are built from Welsh oak, being resistant to salt water. The gates were designed by Thomas Rhodes. 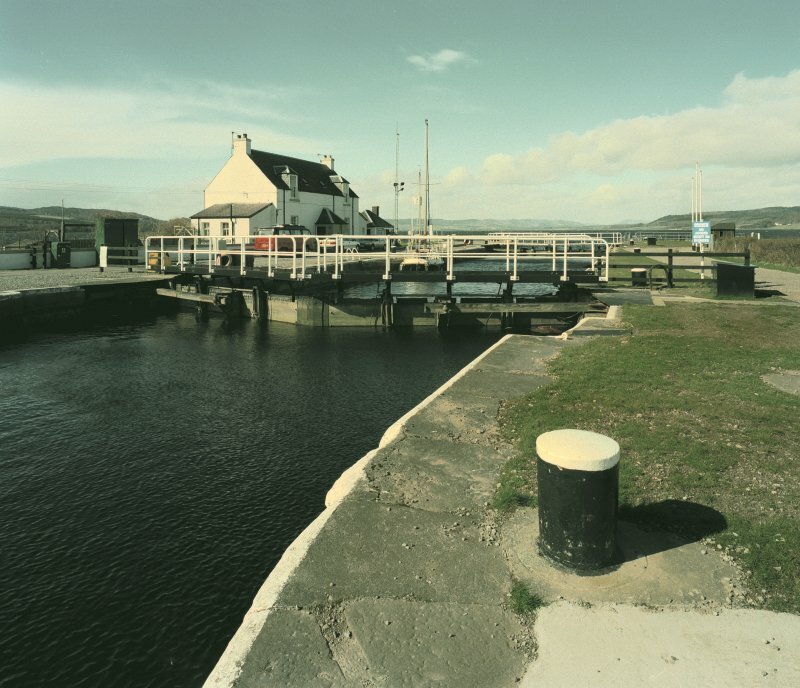 During March 1999, RCAHMS conducted a photographic survey of the standing industrial heritage relating to the swing bridges, canal locks over the Caledonian Canal and the nearby railway architecture in Inverness, Clachnaharry and environs. The purpose of this survey was to enhance and augment the existing holdings of the National Monuments Record Scotland. Visited by RCAHMS (MKO), September 1997. 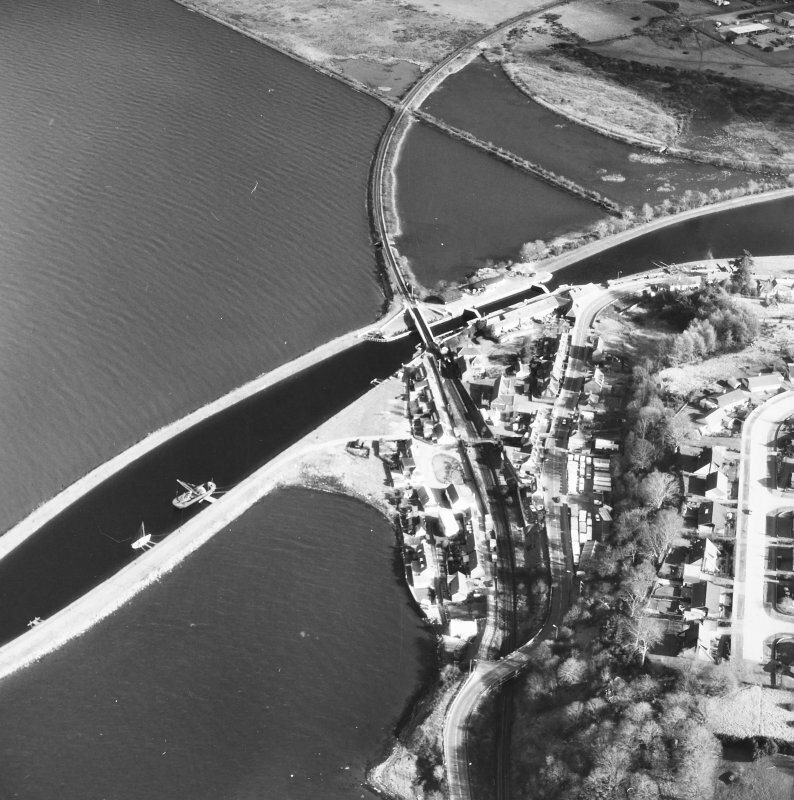 The origin and functions of Inverness Harbour (NH64NE 129.00) cannot, however, be considered in dissociation from fresh factors introduced by the construction of the terminal section of the Caledonian Canal (NH64NW 30.00 and NH64NE 120.00: LIN 19). The Canal was authorised by Parliament in 1803, and was begun under T Telford as principal engineer with W Jessup as consultant. 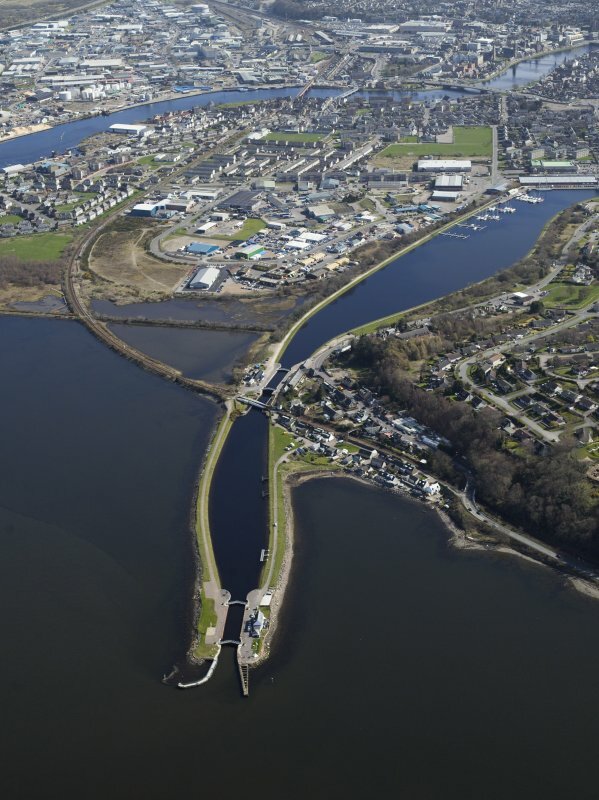 The terminal works consisted of a sea-lock (NH64NW 28.00) at Clashnaharry [Clachnaharry], giving access to a lower basin (NH64NW 30.03), and from this a second lock (NH64NW 30.02) led into Muirtown basin (NH64NE 120.00), which is shown on the plan published by the Harbour Commissioners as measuring about 900yds (822.6m) in length by up to 200yds (183m) in breadth. It was intended primarily to serve the Inverness trade, and the New Statistical Account notes that ships too large to negotiate the estuary were worked from the Canal's wharves. 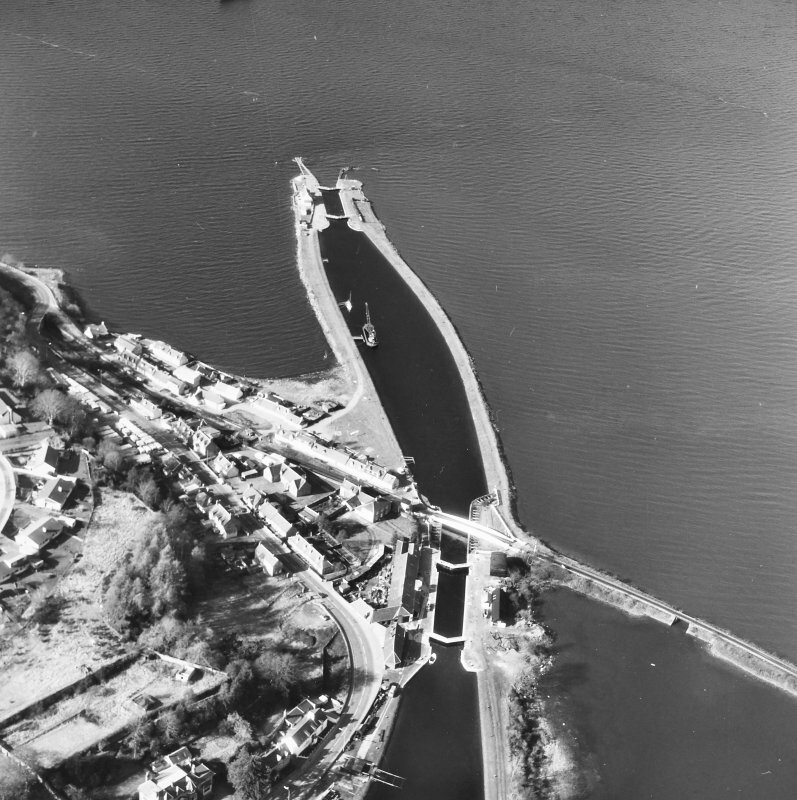 The basin was almost completed by 1807, but difficulties encountered in the building of the sealock delayed progress until 1811, and the canal as a whole was not opened until 1822. Large scale repairs became necessary in 1843, and the waterway was finally reopened only in 1847. A Graham and J Gordon 1998. Caledonian Canal; sea lock and lock keeper's cottage. CFA/MORA Coastal Assessment Survey 1998. 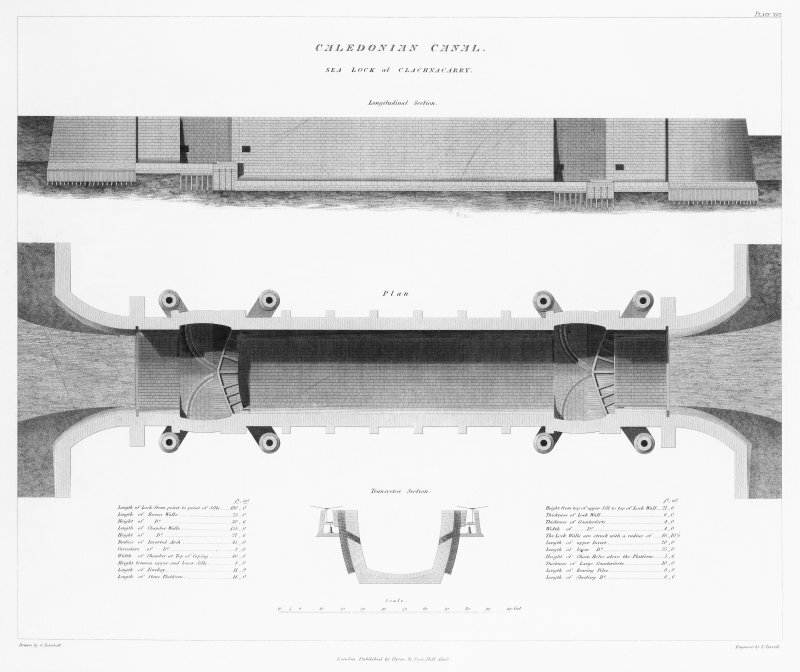 This feature is clearly marked as Sea Lock on the 1st edition of the OS 6-inch map (Inverness-shire 1874, sheet iv), on the 2nd edition of the OS 6-inch map (Inverness-shire 1907, sheet iv), on the current edition of the OS 1:10000 map (1985) and on the OS Basic Scale raster map (ND). Information from RCAHMS (MD) 4 October 2001. 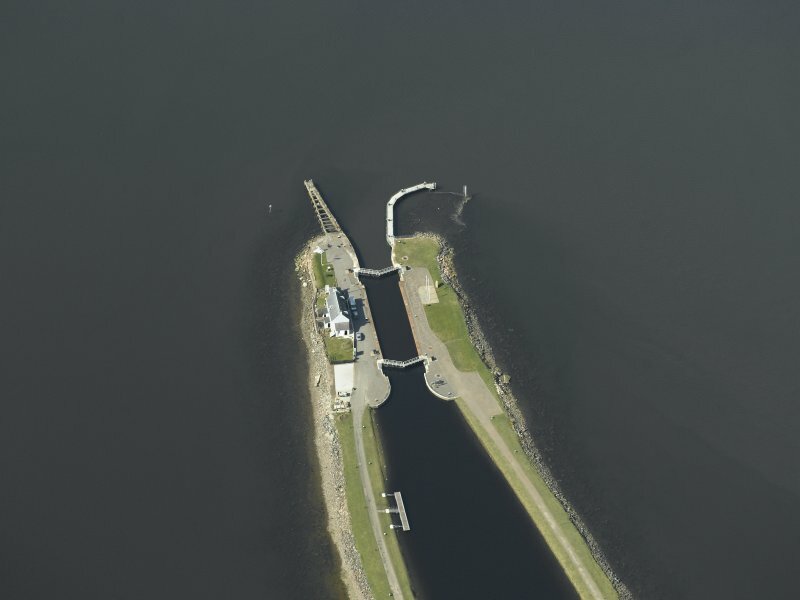 Together with the adjacent basin (NH64NW 30.03), this lock forms the NE extremity of the Caledonian Canal, providing access from and egress to the Moray Firth. Information from RCAHMS (RJCM), 31 March 2006.
pit was then excavated in the consolidated clay and, despite the need to de-water the excavation, at first with a six-horse driven chain pump and, below 15 ft, by means of a 9 hp Boulton & Watt steam-powered pump, the masonry of the inverted arch at the base and the side walls of the lock were successfully completed in August 1812. The lock has a number of bollards, hooks etc consistent with any lock. The outer lock gates have “storm gears” (winches for hawsers which secure gates at times of excessive high tides) – one on each side at NH 64430 46733 and approximately NH 6444 4675. One capstan, NH64NW 28.06, is extant and 3 obvious circular stone settings, the bases for other capstans, are seen on the Kessock bank; there may be others under the gravel. The Lock keepers House, NH64NW 28.01, sits on the Beauly bank of the lock; adjacent to the NE there is a cast iron water point NH 64454 46709 with the words “British Waterways” embossed on it. The terminals of the banks at the north/sea end have substantially built walls of dressed red sandstone which have recently been renovated. 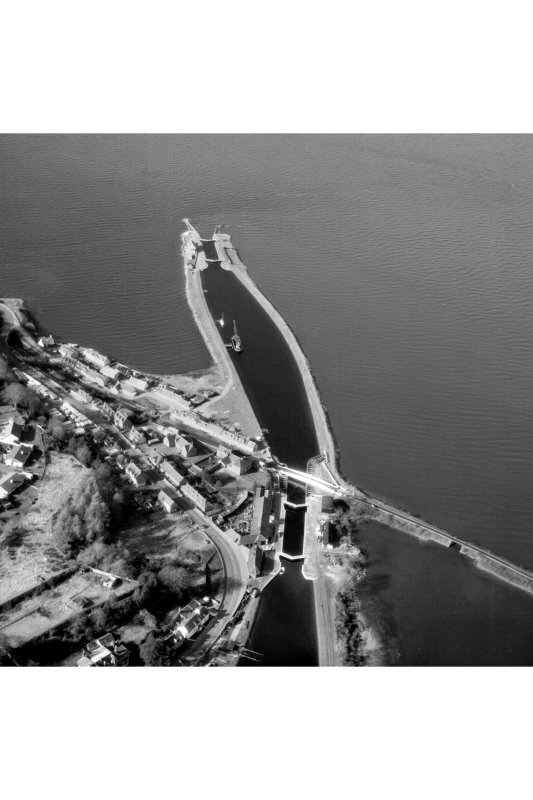 There has also been recent installation of floodlighting and landscaping of the lock; a large inscribed stone slab and 3 flag poles are on the Kessock bank and a car park and flag pole on the Beauly bank. It was common in my childhood to travel the 60 miles of the Caledonian Canal from Inverness to Fort William in an old but graceful yacht, Galante, rescued from ignominy by my father’s skill and my lack thereof. At this tender age I had little appreciation for the yacht, built in Fife in 1937, or the canal itself – an engineering triumph wrought from the heart of the Highlands between 1803 and 1822. They simply provided a method of escape from palpable mediocrity to the wild coasts and islands of the west. At Corpach the canal disgorged us for a summer adventure, with beach landings at Coll, Canna or Mingulay and a clashing accompaniment of midges or high winds. 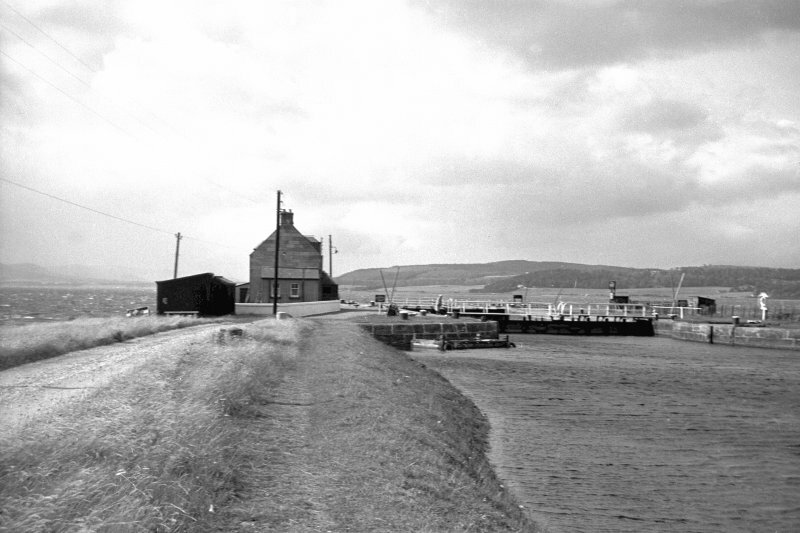 By way of contrast, each school day I passed the eastern end of the canal at Clachnaharry. The occasional yachts and fishing boats, and ‘noddy boats’ as the littlest hire craft were known, punctuated our scholastic commute as the road bridge swung open to let them through. 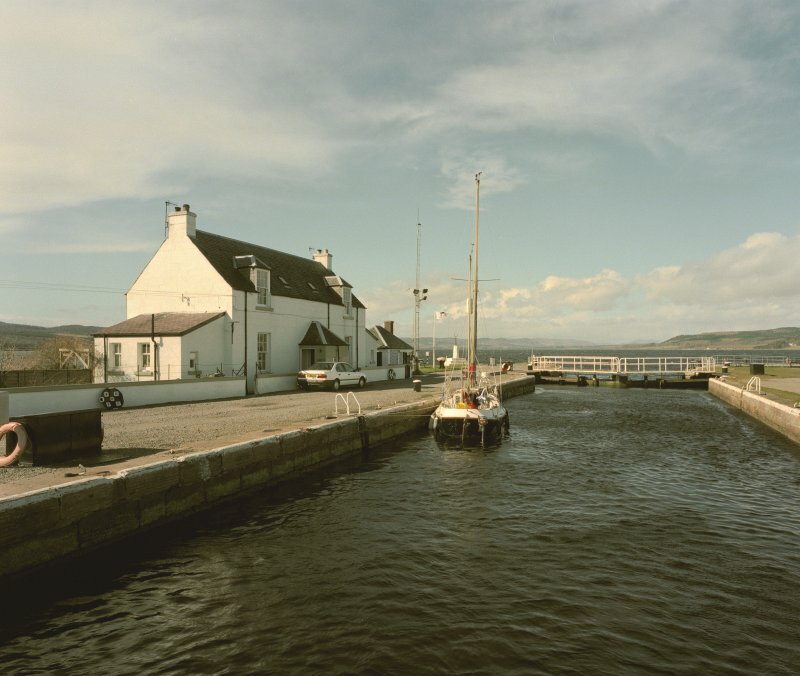 A school friend stayed out at the Clachnaharry sea lock, a place where salt water meets fresh, where turbulence meets calm, and where a distinctly maritime breeze whips over the canal jutting out like the tale of a leviathan. 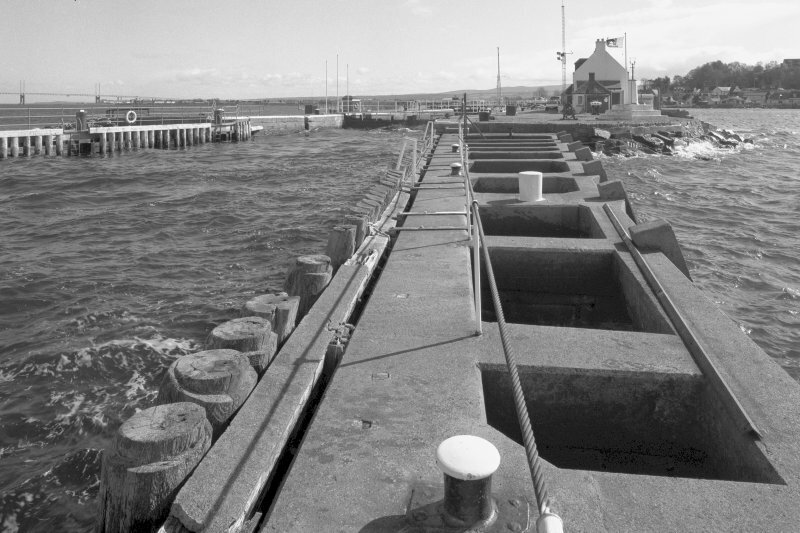 This liminal place was created with great difficulty – the soft muddy bank of the Moray Firth forced the labourers to build two parallel embankments more than 400m out into the sea. Material was taken from ‘the hole’, a still massive quarry in Clachnaharry, and left to settle on the mud for six months. Good quality sandstone was taken by sea from Redcastle across the Beauly Firth 7 kilometres away. Ships entering the sea lock could rest and exchange goods at Muirtown, where cranes, storehouses and a hotel awaited. This area would later develop as the Glen Albyn Distillery, saw, tweed and bobbin mills, and a buoy factory – all now replaced by a somehow less evocative Co-op and B&M Home Store (the Glen Albyn brand is now owned by Diageo). From here five locks lifted the ships up to the level of Loch Ness. One lock claimed the life of a former schoolmate in 1999 as he returned from a night out in the town, and that of his grandfather before him. The story of the canal began some 200 years earlier when the Highlands were undergoing dramatic change – the violent ebb of Jacobean hopes had led in part to subjugation, and certainly to a turn both in land management and in the relations between chief and clansman. Coincidentally population began to rise, famously resulting in the emigration of many thousands of people to the New World, driven by an appetite for a better life, and in many cases by appalling conditions and treatment at home. Government took a close interest, directly managing some estates, striving to control local culture, and pushing forward the fishing industry with investment – the new towns of Ullapool and Tobermory being particularly well known. War too played its part – improving the infrastructure of the Highlands helped to insure against future rebellions, and men of fighting age were increasingly employed in Government regiments. 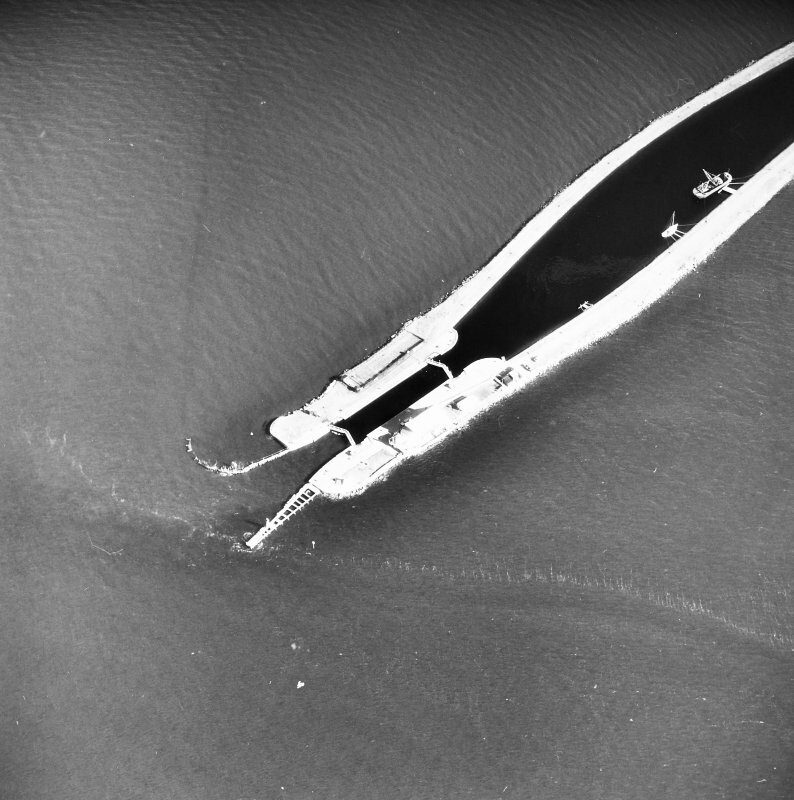 The Royal Navy also had an interest in a better maritime infrastructure. Thus construction on the canal began on the premise that ‘it was feasible, it would be useful and it would stem the tide of emigration’ (Cameron 2005, 26). 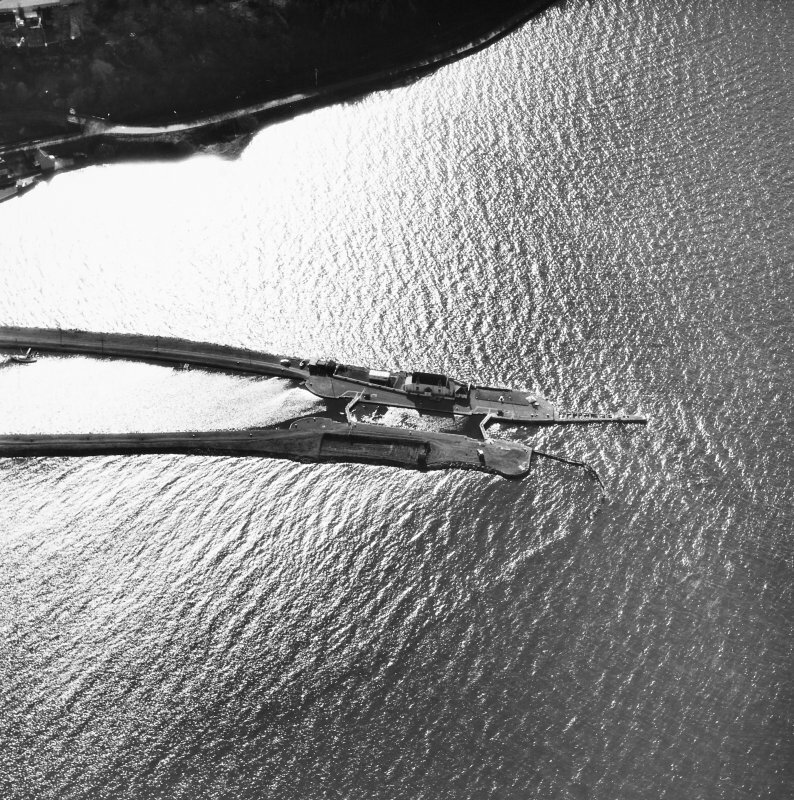 Much of the work was driven forward by Thomas Telford, the ‘Colossus of Roads’, a man whose life’s work is cast among our industrial and transport foundations. The canal is characterised by its white and black livery, the sandstone and wooden locks, workmanlike buildings and, of course, by the stunning Highland scenery. The jigsaw pieces that make up its entire length account for more than 200 sites within Canmore, and more than 1200 items in the archive. But they capture only part of its unique character. It is in fact the pace of the canal that is so remarkable. Moving a large yacht through the locks takes hours – waiting for the clock or the keeper, pulling the boats by hand, tying the bow and stern ropes, letting go, panicking about the crushing weight of 16 unbraked tonnes. And even with a clement wind, a journey through the canal will take a couple of days, with entry and exit to some extent affected by the tide. It is a welcome respite from a bustling modern world and a gentle introduction to the cutting edge of the early 19th century, and the wild scenery of the Highland glens. After a collision off the coast of Muck Galante now stands onshore at Muirtown, like a fish out of water. The canal, with recent reinvestment and renewed interest, looks to have a long and vibrant future, still reflects ideas of Improvement and the hard graft of 3000 Highlanders.